Though the schoolhouse which once stood at Muttock was often regarded during its lifetime as the archtypal Middleborough schoolhouse, Lakeville's own Bell Schoolhouse undoubtedly outranked Muttock's in prestige and was well noted as the first school building in the area to incorporate a bell, a circumstance which accounts for its name. The Bell Schoolhouse was erected in 1796 at what is now the junction of Bedford Street and Lakeside Avenue, and it is said to have been constructed for the purpose of a Baptist meetinghouse, though it is not clear how this tradition relates to the history of other nearby Baptist churches, particularly the Pond Meetinghouse which was constructed at the same time and not so very far distant. At any rate, "a bell was needed, so thought the parishioners at that time, so one was procured." A small cupola was constructed on the roof to house the bell following its arrival. Despite its original function as a church, the Bell Schoolhouse building was soon after its construction utilized for school functions as well, following local agitation for the location of a school in the Assawompsett Neck neighborhood. For a period, the building was occupied jointly by the church and the school, and the building's first pastor, Reverend Stephen S. Nelson also served as its first schoolmaster. Eventually, the church vacated the building which remained devoted strictly to educational uses until 1912. As a school, it officially became known as the Neck School. Locals, however, religiously referred to the building as the Bell School from the one feature which distinguished it from all other Middleborough schools. (It was not until September, 1859, that any school in Middleborough proper acquired such an amenity, when Hercules Weston funded the addition of a bell for the schoolhouse at Muttock). In 1853, when Lakeville was "set off" from Middleborough, its school districts were renumbered, that at Assawompsett Neck becoming District 5. History records little concerning the scholars who attended the small one-room schoolhouse, and focuses instead upon the particular (and peculiar) amenities of the building: the bell outside, and a stove inside. As Vigers notes in her History of the Town of Lakeville, in addition to its bell, the Bell Schoolhouse was noted for its "hog-back" stove, regarded in 1905 as "one of the most curious heating arrangements in existence in the state". The stove had a large oval-shaped body and stood upon four small legs (hence the porcine reference), and had been cast in Assonet by Captain Job Peirce about the time of the building's construction. The stove survived at least one documented attempt by students to blow it up (by deliberately detonating powder in the stove's interior), and eventually became the source of considerable "commotion" during the 1913 Annual Town Meeting in Lakeville, "owing to the fact that it had been taken away" to heat a private garage in Middleborough. Lakeville Constable Joseph Demoranville called for the stove's repatriation to Lakeville which was duly accomplished when he acquired the stove for $4.50 at public auction and returned it to "repose again in Lakeville." 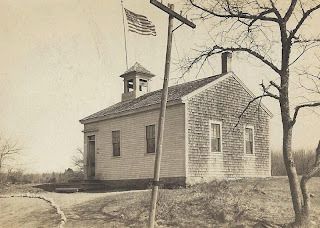 More significantly, the 1913 Lakeville Town Meeting had to address the future of the three schoolhouses (including the Bell Schoolhouse) made redundant by the opening of the Assawompsett School in 1912. The meeting ultimately voted to sell the Bell and Precinct Schoolhouses at public auction, but moved to retain ownership of the schoolhouse at the Upper Four Corners. Though some residents wished to see the Bell Schoolhouse maintained as a public memorial, including Sidney T. Nelson, grand-nephew of Reverend Stephen Nelson, the building's first pastor-school master, this proposal was deemed impractical. Accordingly, the schoolhouse was sold at auction in early April, 1913, to Zebulon L. Canedy who, in turn, sold it to Mr. Nelson. "In making the purchase historic associations figured largely, Mr. Nelson told the Gazette, and for this reason he was anxious to secure it." Mr. Nelson removed the historic schoolhouse to his farm, where it was remodelled into a dwelling. The schoolhouse survived on the property until its purchase in 1946 at which time it was demolished. The bell which for so many years had called young scholars to their studies and had conferred such status onto the Bell Schoolhouse was removed from the building and, in 1929, installed in the belfry of the Grove Chapel Congregational Church on Bedford Street in Lakeville, the present home of the Lakeville Historical Museum.